Published March 27, 2012 by Imperial Beach Patch. Seacoast Drive won’t be getting “pedestrian scale” lighting with solar panels, thanks to a 3-2 vote by the City Council. Supporters had hoped the project would help energize the waterfront at night, encourage investment in IB and benefit the city as a whole. But last week, council members who opposed the idea said that if there are any more delays, the state could take away $1.6 million in redevelopment funding. Mayor Jim Janney and Councilmen Brian Bilbray and Jim King opposed the plan. Members Lorie Bragg and Ed Spriggs backed it. 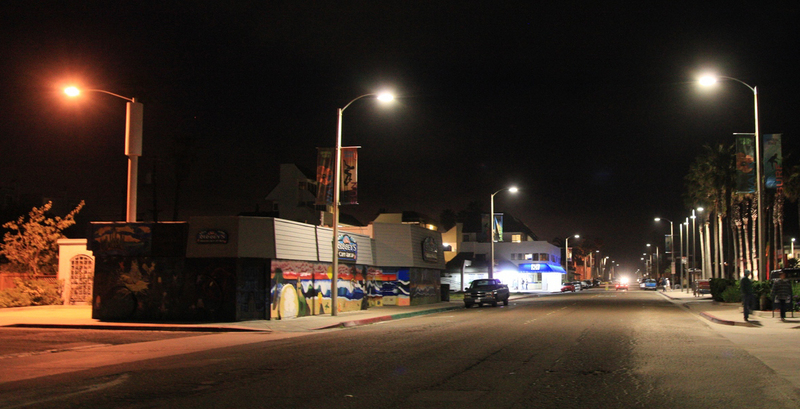 The project would have replaced 22 30-foot street lights with 34 lights 13 to 16 feet high. New street lighting was approved last fall. Since then, Spriggs has pushed to add pedestrian scale lighting to the project. Spriggs called the hotel replacing the Seacoast Inn the largest investment in IB in a generation, and said paying around $100,000 to add 40 pedestrian height street lights with solar panels is a small price to pay to assure good lighting on the beach street at night. Pacifica Companies, the hotel’s owner, agreed—and sent a letter to the City Council in favor of pedestrian scale lighting the day of the meeting, March 21. Beachfront business and homeowners also voiced their support for pedestrian scale lighting at the meeting. Paul Meschle, owner of Sea Breeze Apartments, and real estate agents Richard and Cheryl Shaumburg attended the meeting along with property owner Robert Miller and others. Mayor Janney said he appreciates that pedestrian scale lighting could improve the experience of local residents and hotel guests, but he couldn’t support funding something that didn’t receive complete community input or go through the same process as other proposed improvements. “I understand what everybody’s trying to do with the lighting,” he said, “but I believe if we don’t maintain a process, we are going to get ourselves in big trouble in a short period of time. Improved lighting would be good for other parts of the city to improve safety and reduce crime, Janney said. Janney also said he was concerned that the state could take away money from redevelopment projects. Optimism for the city’s future needs to be balanced with a tough reality, he said. “That wouldn’t give us the immediate thing we would like to see when the hotel opens,” he said, “but it’s not going to make a lot of difference if our funds are taken away by the state before that hotel gets open. Councilman Spriggs, who lives on Seacoast Drive, said City Council had the chance to do something to increase the economic potential of the entire city. He called the new hotel “the most important development in modern times in Imperial Beach” and went so far as to say that without redevelopment money, the hotel’s success is critical to the city’s survival in the future. “You’ve got a street that’s the engine of our growth for the future. Let’s face it,” he said. Councilwoman Bragg agreed that a successful beachfront helps the rest of the city. “A rising tide raises all boats, and I’ve always looked at Seacoast Drive as our boat that we can all get into and row to prosperity,” she said. After the vote struck down pedestrian scale lighting, Spriggs proposed that if a portion of the $2 million allotted for the light installation is left after the first set of lights is installed, then the remainder could be invested in the solar lights. That vote was struck down as well by another 3-2 vote. This entry was posted on Saturday, February 8th, 2014 at 2:56 am. It is filed under Story Archive and tagged with government, Imperial Beach City Council, Imperial Beach Patch. You can follow any responses to this entry through the RSS 2.0 feed.